Cover art for "Red Moon Rising: Sputnik and the Hidden Rivalries That Ignited the Space Age" by Matthew Brzezinski. The book will serve as the basis for a TV series being developed by Primeridian Entertainment and “Star Trek” screenwriter Nicholas Meyer. The story of how the space race between the United States and former Soviet Union was born out of the Cold War may be retold as a new television series now being developed by a newly-launched production company and a "Star Trek" screenwriter. Primeridian Entertainment said Wednesday (June 26) that it has hired "Star Trek II: The Wrath of Khan" screenwriter and director Nicholas Meyer to write a pilot episode and treatment for the TV series, which "will examine the tense competition between the U.S. and USSR superpowers at the height of the Cold War, starting with the scramble to capture the remains of the Nazi V-2 [rocket] program." 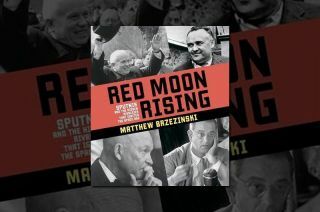 To help Meyer shape that story, Primeridian has optioned the rights to "Red Moon Rising: Sputnik and the Hidden Rivalries That Ignited the Space Age," the 2007 book by Matthew Brzezinski, a former Moscow correspondent for The Wall Street Journal. "In 'Red Moon Rising,' Matthew Brzezinski takes us inside the Kremlin, the White House, secret military facilities, and the halls of Congress to bring to life the Russians and Americans who feared and distrusted their compatriots as much as their superpower rivals," publisher Times Books wrote. "'Red Moon Rising' recounts the true story of the birth of the space age in dramatic detail, bringing it to life as never before.'" The New York Times, in its Sunday Book Review, saw the potential for Brzezinski's work to be adapted. "['Red Moon Rising'] tells the story of American and Soviet decisions with remarkable dramatic — even cinematic — flair," Mark Atwood Lawrence, who teaches history at the University of Texas at Austin, wrote in the paper's review. Primeridian is also in discussions with Cold War experts, including Sergei Khrushchev, son of Soviet Premier Nikita Khrushchev, to act as a consult on the project. Brzezinski interviewed Sergei Khrushchev for "Red Moon Rising." Primeridian, which is led by actor Arcadiy Golubovich and studio executive Tim O'Hair, will produce and finance the still-untitled space race television series itself. "Given my Russian heritage, I'm particularly excited to see Nick Meyer weave together both sides of the story with a balanced approach," Golubovich said, "creating the most comprehensive and exciting re-telling of the space race for television." "The series will recount the human-interest stories that we never fully learned in our classrooms," said Meyer. "We hope audiences everywhere are looking forward to this thrilling tale of rivalries between the United States and Soviet Union and the race to control outer space." In addition to "Star Trek II: The Wrath of Khan," Meyer also directed "Star Trek VI: The Undiscovered Country," the sixth movie in the "Star Trek" franchise, and wrote the screenplay for the fourth, "Star Trek IV: The Voyage Home." His film adaptation of his own bestselling 1974 novel, "The Seven-Per-Cent Solution", which teamed Sherlock Holmes with Sigmund Freud, was nominated for an Academy Award.